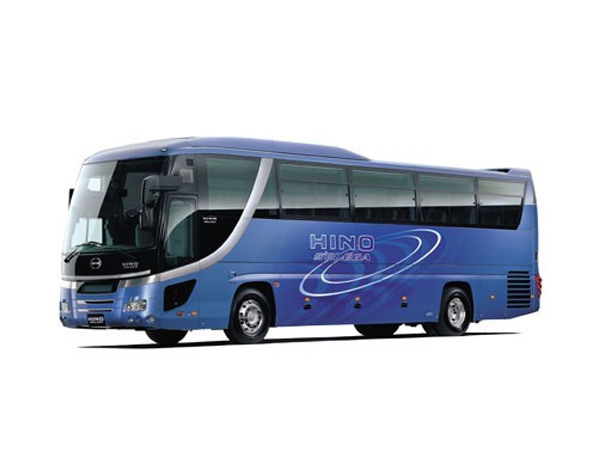 "Hino Bus - Commercial Passanger Vehicle"
Hino Buses are built fuel economy & the environment in mind. Equipped with Euro compliant engines, these buses release the one of lowest emissions in the market. Each bus is geared towards providing economically viable travel for the masses. The frames of all our buses are coated with rusted-resistant material, ensuring it will retain its masculine appearance for years to come. Seats & carpeting are made of tough & resilient nylon fiber, that are machine washable. This allows a longer operating lifespan, whilst reducing wear & tear. Designed to provide safety, & comfort, stabilizers & improved suspension systems offer a smoother & gentler ride. A sound proofed interior, ice-cold air conditioning, reclinable sears with generous headrests & leg room promises a pleasant journey always. Hino buses are equipped with hydraulic retarders to secure a stronger braking force, while an ABS system produces a more effective grip, reducing the risk of skidding. Better handling with shock absorbers & rear stabilizers give peace of mind to weary passengers.